Ich habe mir mal aus Spass meine Twitter Cloud erstellt. Hierbei werden alle Woerter die ich in meinen letzten 3.200 Tweets getwittert habe ausgewertet, und nach der Haeufigkeit mit der sie vorkommen dargestellt. Je groesser ein Wort dargestellt ist, desto haeufiger kam es in meinen Tweets vor. Wenig erstaunlich ist, dass ich sehr oft ueber oder mit Kai (@agentK) spreche, allerdings war ich sehr ueberrascht, wie viele sehr positive Worte (happy, great, good, Welly, NZ, friends, cat) vorkommen. Ich bin doch eine echte Frohnatur! I’ve just created my Twitter cloud, just for fun. It uses the words that appear most often in my tweets – the bigger they are in the picture, the more often I used them. 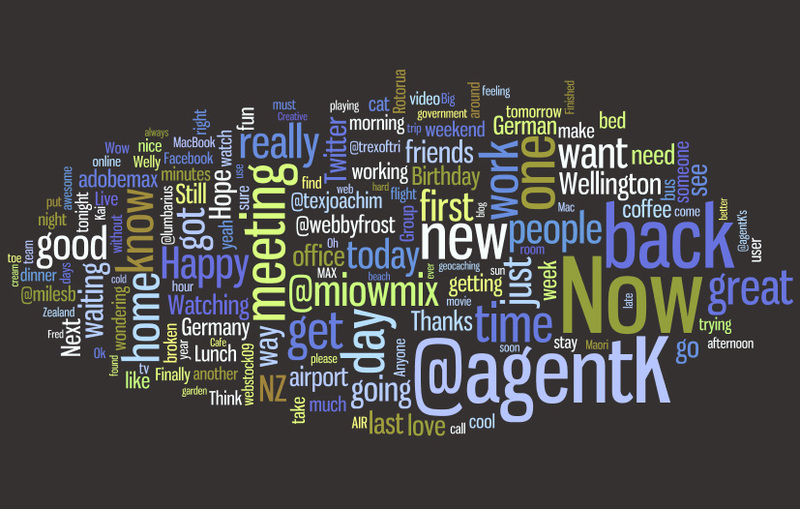 I wasn’t surprised that I talk with or about Kai (@agentK) a lot, but the frequency of very positive words (happy, great, good, Welly, NZ, friends, cat) seems to be a bit astonishing. I must be a very cheerful person!